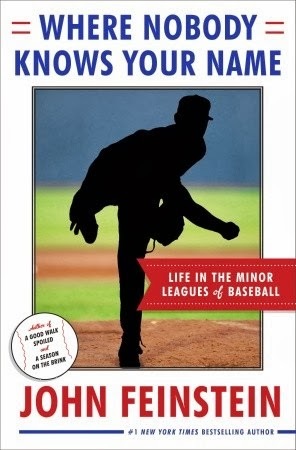 John Feinstein, Where Nobody Knows Your Name: Life in the Minor Leagues of Baseball, Doubleday. John Feinstein, sportswriter/commentator of great repute, spent the 2012 baseball season roaming around Triple-A, mostly in the International League. He followed several players, an umpire, and two managers (including the Durham Bulls’ Charlie Montoyo). We heard him interviewed by our own Patrick Kinas during that season. I really wanted to like this book because very little has been written about Triple-A baseball and Feinstein spends a good bit of time with managers and players I am intensely curious about. I am a fan of Charlie Montoyo and really wanted to hear what he’d said to Feinstein. Nevertheless, I have my reservations that I’ll get to later. For Bulls fans you need to know up front that several Bulls, former Bulls, and DBAP denizens who were prominent in the 2012 season get at least some mention, including Craig Albernaz, Chris Gimenez, Dan Johnson (he was playing for the Charlotte Knights that year), Stephen Vogt, Jeff Salazar, Brooks Conrad, Reid Brignac, Wil Rhymes, Scott Strickland, broadcaster Patrick Kinas, Rich Thompson, the Matsuzaka/Matsui matchup game, and more names that I’m probably forgetting. But all of them also show up right here in WDBB if you search on them. Feinstein worked hard to get inside the heads of the players and managers of Triple-A, reinforcing WDBB’s own view that Triple-A, while it is a minor league, is also different from the rest of the minors in that the players are so very, very close to the majors. His technique is to introduce several players (veteran pitchers and position players), two managers (Norfolk’s Ron Johnson in addition to Durham’s Montoyo), and an umpire at spring training. He then spends some time with them throughout the season. Along the way he introduces a ton of other folks and, to be honest, I began to lose track of who was in the spotlight and could not follow just why they were introduced. All the players highlighted were players who had made it to the big leagues for at least a few games and were trying to make it back and/or decide to not try any more. I often lost the thread of the stories he was trying to tell. Entirely missing is an effort to take Triple-A as a baseball experience of its own. Admittedly, that’s a rare thing to try to do, and there’s likely little audience. But some small fraction of the audience at the 2,000 games played in the International League each year go to the games because they want to watch a specific team play within a specific context of International League competition. On the other hand, the book is full of trivia that I’ll probably be using for years. Final assessment: Bulls fans might need to read this book, but it is a bit of a slog. Plus, what Bulls fan really wants to remember much about 2012? On the shelf at Raleigh’s Quail Ridge Books. The author was on Morning Joe the other day and somehow the Bulls were brought up. Sings like an interesting book.